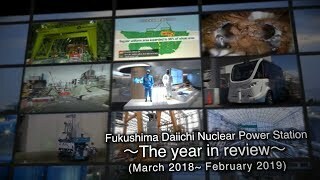 Improvements have been made to the working environment at Fukushima Daiichi Nuclear Power Plants, whose decommissioning is proceeding strategically according to the so-called mid-to-long-term roadmap. 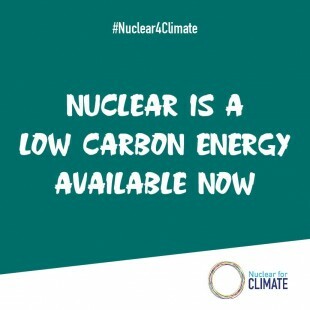 When the accident occurred at the NPPs 7 years ago, the initial efforts to bring it under control involved primarily stabilizing the reactors and suppressing the emission of radioactive materials. On July 28, the J-Village Stadium in Naraha Town, Fukushima Prefecture, which served as the base for the NPPs-related activities, is to be restored to its original role as Japan’s first national soccer training center. During the past seven years, as the site of contamination examinations and worker decontamination, it was where the workers put on radiation protection equipment and took it off, as well as where dosimeters were distributed and returned. 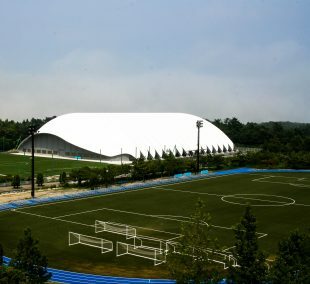 J-Village, originally established as the national soccer training center in 1997, once served as the venue for matches between top domestic and foreign teams. It will again assume that role, with the addition of all-weather practice fields (to open next spring) and a new hotel. The aim is to go beyond the promotion of soccer and sports, and to meet the needs of businesses through its capacity to host conventions and the like. 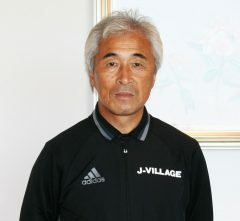 Prior to the reopening of J-Village, AIJ talked with J-Village Vice President Eiji Ueda, with excerpts of the interview below. More than seven years have elapsed since the accident at Fukushima Daiichi. How do you feel about J-Village’s reopening, which will happen shortly? I have worked for J-Village since July 2013. When the Fukushima Daiichi accident occurred in 2011, I was serving as chair of the JFA Women’s Committee. In the wake of the accident, it was sad for me (though of course I understood why) to see dormitories erected on what had been the playing field. I felt sad because it seemed that the Village was being lost to the accident, and I wondered if it would ever be restored. Even in March 2015, when the restoration of J-Village was launched, I was convinced that a manpower shortage would cause delays. But here we are—just 3 years later—close to its actual reopening. I am grateful especially to the devoted efforts of those involved in the work. What problems, in your opinion, are hampering the accelerated restoration of Fukushima? What can J-Village do about them? I think that unfounded fears and rumors must be eliminated. As J-Village is only some 20km from Fukushima Daiichi, people still ask if soccer can really be played there. Besides being used by Japanese soccer teams, the facility will also be the venue for training camps for the 2019 Rugby World Cup. The fact that soccer and rugby can be played here—without any problems—will be clearly seen by everyone at those times. I hope that this will help dispel people’s fears. Next month (August 2018), a total of 7,000 people, both children and adults, have already booked the facility for use in various sports’ training camps. Those people obviously already understand that the facility is safe to use. We will also aim to demonstrate—both steadily and sincerely—the high quality of our meals and accommodations, and the convenience of our integrated facilities. Would you like to say anything to the workers at Fukushima Daiichi? Having personally visited the site, I know that several thousand people are still working there today. Without their efforts, we could not live as safely as we do, and I deeply appreciate everything that they have done. I also think that it is important to have as many people see them working as possible, so that they can gain the same understanding as I have.